Welcome back. A few weeks ago, when I was blogging about using body camera video transcriptions to address the limitations of citizen recollection and direct observation (Traffic Stop Racial Disparities), I came across a somewhat related study of equal interest. Researchers from the U.K.’s University of Huddersfield had examined how a preexisting relationship among eyewitnesses can influence the witnesses’ statements. Eyewitnesses often provide the major lead in an investigation. Still, of the wrongful convictions exonerated by DNA testing, most--some 70%--were due to misidentifications. - Eyewitnesses can be influenced into false recall by co-witnesses to the extent that blame may be wrongfully placed. - Most eyewitnesses to an event have a preexisting relationship with their co-witnesses. - People are more inclined to accept the judgement of people they know. 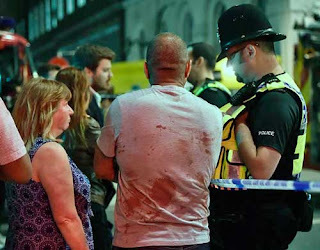 While the effects of co-witness familiarity have been examined for pairs of eyewitnesses to an event, social psychology suggests the effects would be very different when more than two eyewitnesses are involved, which is a common occurrence. The current study set out to observe how discussions within groups of eyewitnesses to an event affect blame attribution and, further, to determine if co-witness familiarity has an effect. Toward these ends, the researchers enlisted 420 participants, average age 33, and separated them into 84 groups of 5 persons. Participants in 36 of the groups had preexisting relationships of at least 3 months; those in 16 groups were strangers to one another; and those in the 32 control groups were also unfamiliar to one another. The participants all viewed about 1.5 minutes of TV footage of a bar fight. The fight began when a man dressed in green attacked a man dressed in yellow. The two men fought for 40 seconds before being separated. Participants in all except the control groups then discussed within their groups what they’d seen. Control group participants were not permitted to discuss the event. Finally, each participant was interviewed individually for his or her statement of what they had witnessed, especially who threw the first punch. They were asked to avoid guessing and report if they were uncertain. Taking the individual responses of each group’s five members, the researchers calculated the percentage of members in agreement (average statement similarity) and the percentage of members who blamed the correct suspect (blame attribution accuracy). For example, if a group had 3 of 5 members in agreement, the average statement similarity would be 60%, but if those 3 members agreed on the wrong suspect, the blame attribution accuracy would be 2 of 5, or 40%. Groups with preexisting relationships had significantly higher levels of both statement similarity and blame attribution accuracy than either the no-relationship or control groups. There was no significant difference in similarity or accuracy between the latter two groups, suggesting post-event discussion among strangers had no real influence. Of note regarding blame accuracy is that the percentage of eyewitnesses who were uncertain in groups with preexisting relationships was significantly lower than in the other groups, lending further support to eyewitnesses being more susceptible to influence by co-witnesses they know. Given that co-witnesses with preexisting relationships pose the highest risk of influencing each other’s statements, the researchers emphasize the importance of determining if eyewitnesses have discussed the event prior to giving statements and if the witnesses know one another. Police officers can attempt to assist eyewitnesses to differentiate between witnessed and post-event information. Try to listen for comments about co-witness discussion and familiarity the next time you’re selected for jury duty. Thanks for stopping by.